Man: Where is the meat? 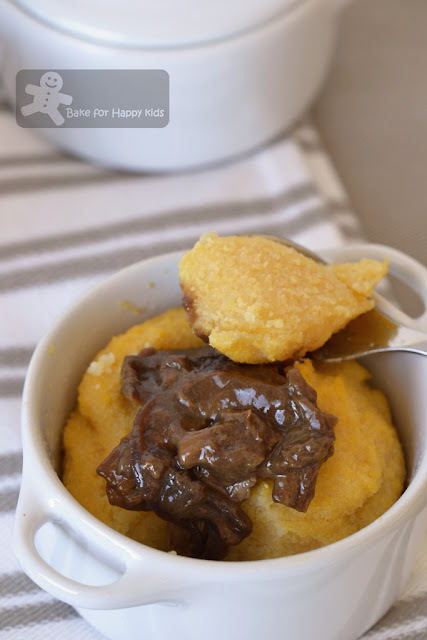 To me, this almost vegan mushroom ragoût with oven-baked polenta (minus the chicken stock) is a simple but elegant autumn meal to eat. To my husband and son, these are plain boring! We love mushrooms and eat at least a large bag of mushrooms at least once a week. I wasn't expecting any of these negative remarks and wonder if I have cooked this mushroom dish well enough with my Italian-Asian mushrooms combination. Accordingly to Nigella's description, the more wild ones the better... I wasn't too sure about eating too much wild mushrooms with unexpected assorted woody, tough or chewy textures. 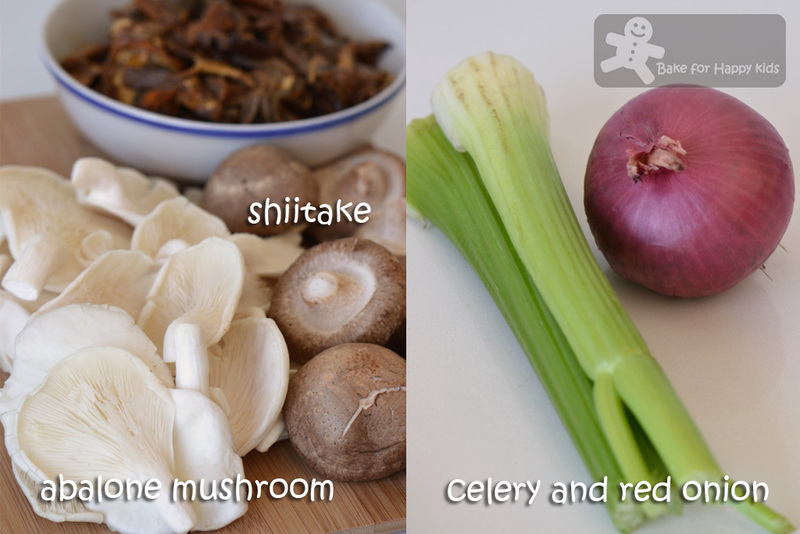 And so, I didn't want to take the chance of exploring the wild mushrooms and choose to play safe cooking with these three types of mushrooms that can be commonly found in our local deli and supermarket. My first choice is porcino. Widely distributed in the Northern Hemisphere across Europe, Asia, and North America, these mushrooms are not found naturally in the Southern Hemisphere. It is very difficult to cultivate and mostly sold being dried. It is used in many cuisines especially in Italian pasta or risotto. My second choice is shiitake which is a commonly consumed by most Chinese and Japanese with a strong earthy taste. My third choice is the mild-tasting oyster mushroom. 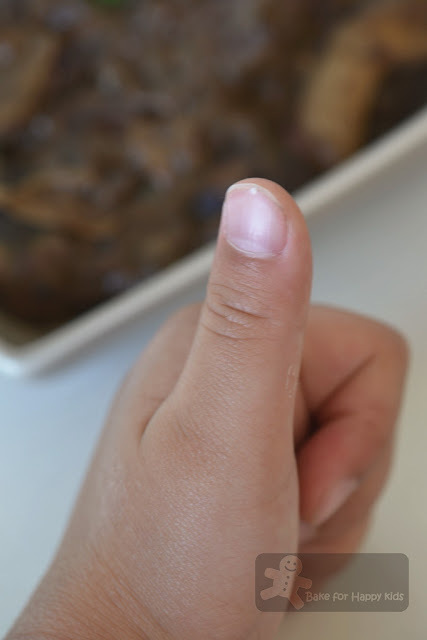 I chose this for its thick, meaty white stem and also its milder taste to neutralize the overall combination of other stronger-tasting mushrooms. All done! This Italian-Asian mushroom combination looks good, isn't it? As you can see, this dish was not popular in my family. We managed to finish half of the mushroom ragoût and had the rest as leftovers. Subsequently, I used the leftover by stirring it into 3-4 cups of warm cooked rice and 1 can of 420g sweet corn kernels. I served these leftover to my husband and son, telling them that these are mushroom fried rice. Guess what? Everything was gone without any complains! At this point, I would like to conclude that there is nothing wrong with this mushroom ragoût. I'm guessing that the only reason is we might be a little too Asian for this dish. 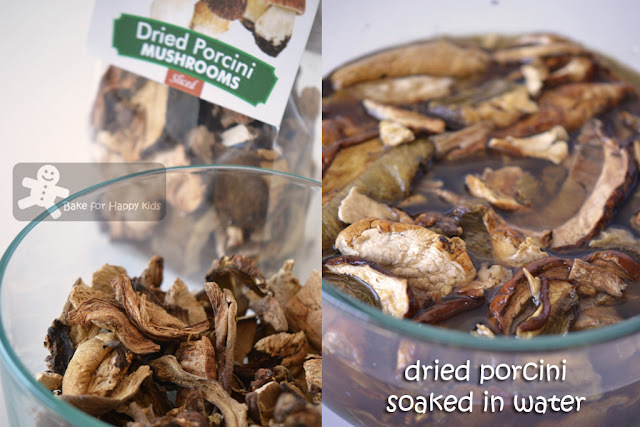 Wipe mushrooms thoroughly, trim off tough or woody stems and slice or cut them into generous pieces. 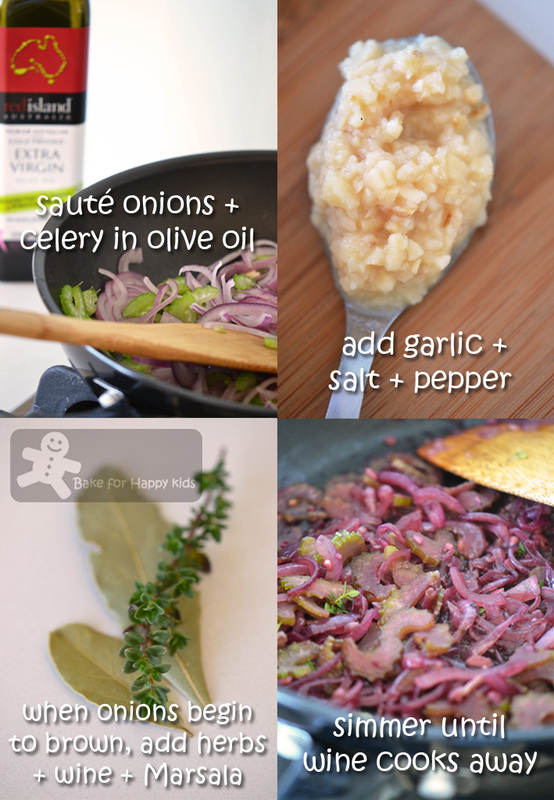 Heat 1 tsp of olive oil in a frying plan and sauté the onion and celery in a pan until they begin to soften. Add garlic and some salt and pepper and continue cooking until onions begin to brown. Add half the red wine and half the Marsala, bay leaf and thyme. Turn down the heat and simmer gently until wine cooks away. 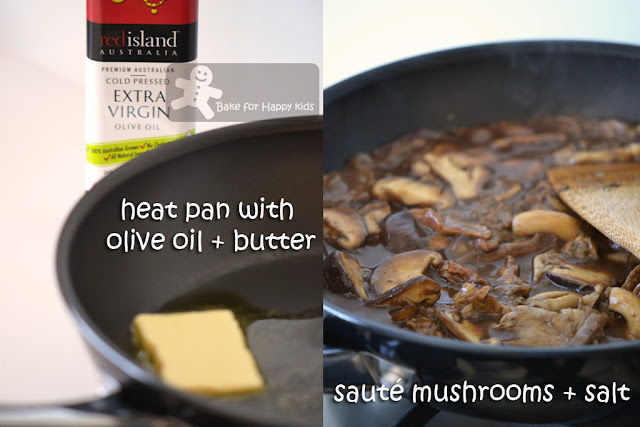 In a separate pan, sauté mushrooms with 1 tsp of olive oil, 1 tbsp of butter and a pinch of salt until their excess liquid cooks away and begin to colour. Add the remaining wine and Marsala and allow the wine to simmer down. Transfer onions to the mushrooms. Re-use the pan that was used to sautéed the onions. 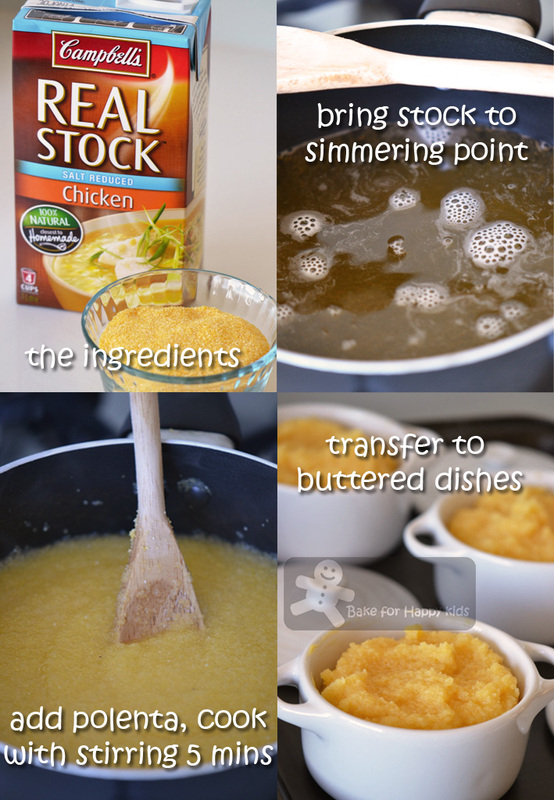 In this pan, melt 1 tbsp of butter. Stir in the flour and keep stirring for a few minutes while it turns golden. Whisk in the stock and mushroom water. Add this sauce to the mushrooms and onions. Simmer very gently for 10 mins. Serve with steamed or boiled rice or polenta. Butter a shallow 2 1/2- to 3-quart baking dish or ramekins, and set aside. Place stock or water and salt into a large saucepan, and bring to simmer. Remove pan from heat. Heat oven to 350°F or 160°C fan forced. Slowly pour polenta into stock, stirring rapidly with a wooden spoon. Place pan on medium heat. Slowly bring to a boil, stirring constantly in same direction. Boil 5 mins, continuing to stir. 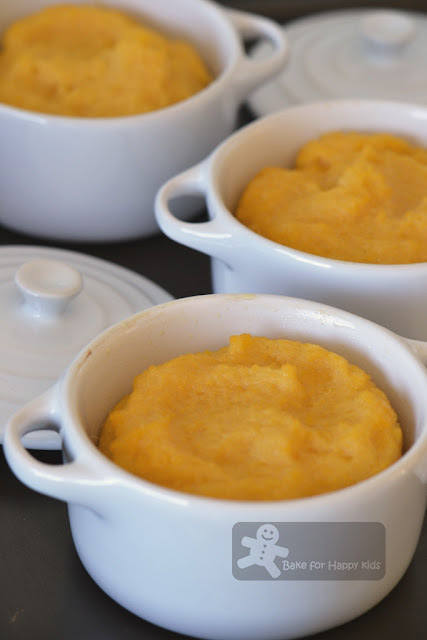 Pour polenta into buttered dish or ramekins, and cover with buttered foil. Bake for 1 hour or 45 min for ramekins. Remove foil and serve. 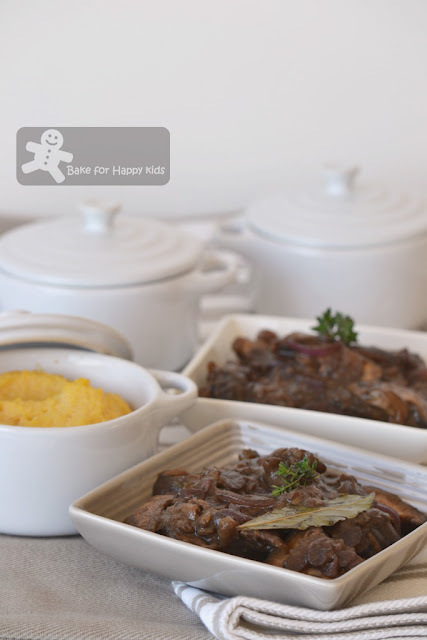 Oh Zoe, looks delicious this mushroom ragout...and yes perfect paired with polenta...yum! I try to imagine the taste of the combination...this fusion dish looks good to me! 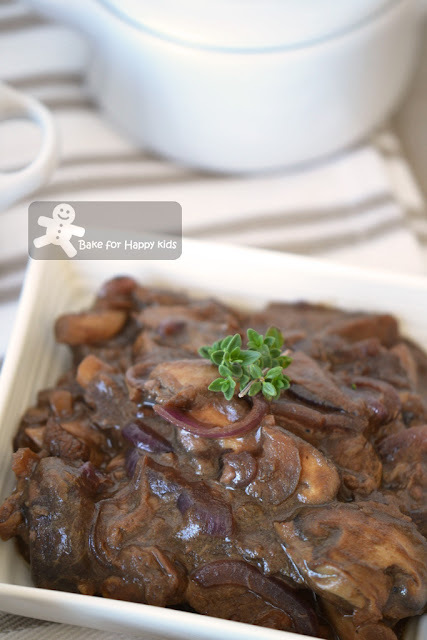 The mushroom ragout does look delicious! Looks like your hubby does not favour vegetarian dish much, and like you, I would probably ended up eating most of it in my house too! I should think that it would be OK for me, as I like all the ingredients that makes this ragout! And I have not given polenta a try, something that I've always wanted to. Have a good trip, take care and see you when you get back! Enjoy! Hi Zoe, I was laughing when you mentioned that you hubby and son asked where is the meat? It has been a hard fight getting less meat into my family's diet as well, its coming along! Wow time flies, can't believe its been 6 months since I caught up with you in SG. How long will you be visiting this round? I will be at Singapore and Taipei for 2 weeks (Taipei only for 5 days). Zoe, if i serve this to my husband and son, it wouldnt even be quarter finished! 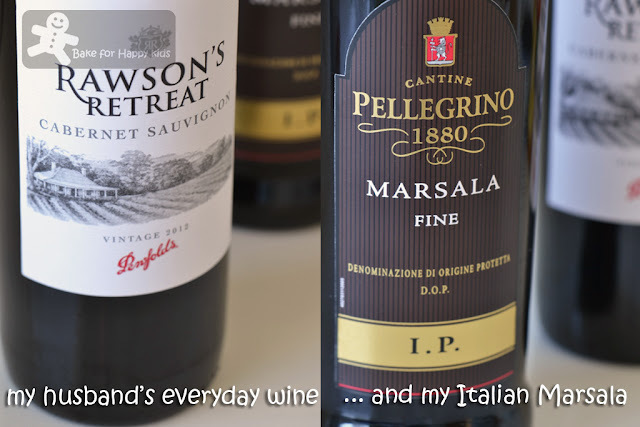 Haha, i however has a more western palate and would love the mushroom ragout, it sounds very delicious. Might try this with baguette or pasta instead and see what reactions i get from the two men heehee. Hi Zoe, your mushroom ragout looks delicious to me. My family also do not like ragout, polenta and risotto. I agree with you sometimes we are too Asians to certain food. Recently, a relative had sambal belacan with my seafood paella and made me wonder what went wrong with the food. What a gorgeous treat! I haven't tried any of Nigella Lawson's recipes. But u've certainly done a good job. It's really good to be back blog-hopping after a month's absence, Trishie! I've missed your post :) Hope you're well! I love mushrooms and so does my husband but both my children refuse to eat them. I will have to try some recipes this month to see if I can change their attitude. I love the sound of this ragout - very tasty. Wine..this dish really sounds great! 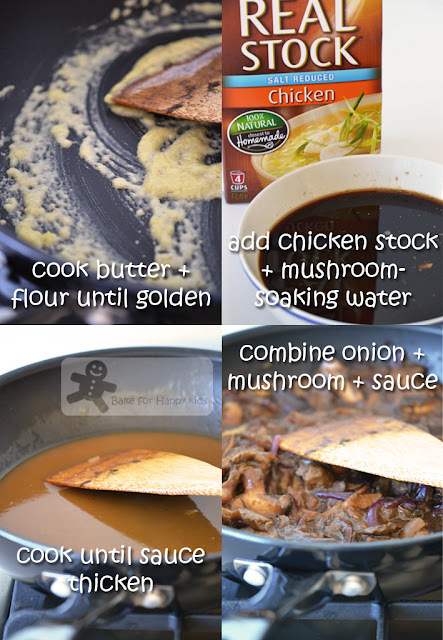 It's a nice and new way to prepare mushrooms! I will have this dish anytime! My impression is that men are meat lovers - its got to be some evolution thingy. I have not cooked polenta this way before, I have a feeling the family would not be taken to it as well! But the mushroom ragrout looks delicious! Zoe, haha, not just you, my hubby will do the same too! He can't live without meat. I like the porcini mushroom. I bought a bottle of ground porcini which I have been using in marinating meat. Looks very interesting & well presented. I'm surprised your husband and son would say anything more than "yum!" given that they know what to expect from your meals! This looks incredible! I love anything with mushrooms in it! Deliciousness!